You can restart IIS and disable Reliable Restart using the command prompt and Iisreset.exe. See the following command-line usage and parameters. /RESTART Stop and then restart all Internet services. /START Start all Internet services. /STOP Stop all Internet services. /REBOOTONERROR Reboot the computer if an error occurs when starting, stopping, or restarting Internet services. /NOFORCE Do not forcefully terminate Internet services if attempting to stop them gracefully fails. /TIMEOUT:val Specify the timeout value (in seconds) to wait for a successful stop of Internet services. On expiration of this timeout the computer can be rebooted if the /REBOOTONERROR parameter is specified. The default value is 20s for restart, 60s for stop, and 0s for reboot. /STATUS Display the status of all Internet services. /ENABLE Enable restarting of Internet Services on the local system. /DISABLE Disable restarting of Internet Services on the local system. Connecting to the Internet Through a Proxy? Want to know if you're connecting to the Internet through a proxy? Go to whatismyproxy.com and find out. In addition to detecting if you are connected through a proxy whatismyproxy.com will show your browser, OS, external IP and more. 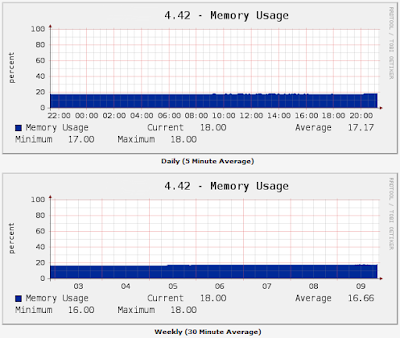 . .
My SonicWALL NSA security appliance seems to have a memory leak. I noticed this a few days ago when I was reviewing long-term usage in my RRDTool (compliments of Cacti) graphs. The daily and weekly graphs looked normal. . . 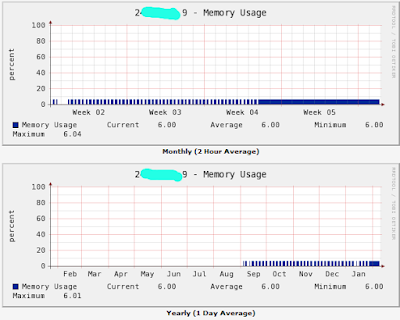 I restarted the SonicWALL a couple weeks ago at which time the memory utilization reset and looks like it's climbing a little since then. But when I looked at the memory usage for the past nine months or so it was pretty obvious the usage has climbed steadily over that time, resetting twice when it was restarted. This definitely shows the usefulness of gathering long-term stats. But I am concerned that the firewall has a memory leak so I'll have to figure that out. I took a look at a couple other, older SonicWALL's which aren't exhibiting this behavior. 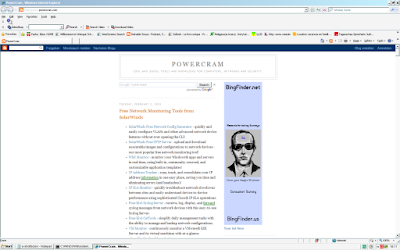 Browsershots makes screenshots of your web design in different browsers. It is a free open-source online service created by Johann C. Rocholl. When you submit your web address, it will be added to the job queue. A number of distributed computers will open your website in their browser. Then they will make screenshots and upload them to the central server here. Just go to browsershots.org and specify which OS/browser combinations to use. SolarWinds Free Network Config Generator - quickly and easily configure VLANs and other advanced network device features without ever opening the CLI! SolarWinds Free TFTP Server - upload and download executable images and configurations to network devices - our most popular free network monitoring tool! WMI Monitor - monitor your Windows® apps and servers in real time, using built-in, community-sourced, and customizable application templates! IP Address Tracker - scan, track, and consolidate your IP address information in one easy place, saving you time and eliminating errors (and headaches)! IP SLA Monitor - quickly troubleshoot network slowdowns between sites and easily understand device-to-device performance using sophisticated Cisco® IP SLA operations. Free Kiwi Syslog Server - receive, log, display, and forward syslog messages from network devices with this easy-to-use Syslog Server. Free Kiwi CatTools - simplify daily management tasks with the ability to manage and backup network configurations. VM Monitor - continuously monitor a VMware® ESX Server and its virtual machines with at-a-glance virtualization health statistics. SolarWinds Free Real-time NetFlow Analyzer – capture and analyze up to one hour of NetFlow data to see what types of traffic are on your network, where it’s coming from, & where it’s going. SolarWinds Free Exchange Monitor – continuously monitor Exchange and get real-time insight into services, mail queue sizes, and host server health with this clever desktop dashboard. SolarWinds Free NetFlow Configurator - configure NetFlow v5 via SNMP on supported Cisco® devices - a perfect complement to Orion NetFlow Traffic Analyzer and our free Real-time NetFlow Analyzer tool! SolarWinds Free Advanced Subnet Calculator - compute addresses for IP subnets - another perennial favorite in our suite of free network monitoring tools! The advantages of the Cacti are having many plugins that is provided by a wide community of Cactiusers.org. 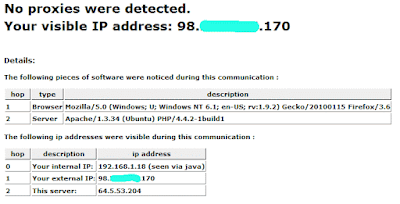 Discovery: auto discovery to detect the SNMP devices on the network with diferent subnet. Flowviewer: Viewer to see the flow of data dicapture by netflow on cisco router. Monitor: monitors the condition of up/down from the monitored device, is also accompanied by sound alerts. Realtime: Displaying graphs in realtime Cacti every 5 seconds. CactiEZ is a self installing Linux Distribution based off CentOS that sets up and configures a customized Cacti install. Everything is designed to be completely automated and working directly out of the box. This compact distro is loaded with extra features such as Syslog and Netflow data collection, Weathermaps, Reports, Auto Discovery, Router Config backup, Nagios, and much more! Both 32 Bit and 64 Bit installations are possible from the same CD. The CactiEZ ISO or torrent can be downloaded here.